WATERPROOF: high-quality waterproof material with a special-shaped zipper will keep your items dry in almost any weather condition. ADJUSTABLE LENGTH 27.5 to 40.5. SPECIAL EARPHONES HOLE for a pleasant workout. BE SAFE AND SEEN IN THE DARK. 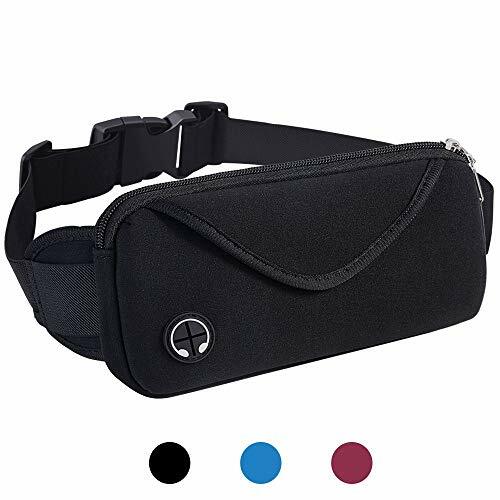 HAVE MORE FUN DURING ACTIVITIES with THE BEST runners waist pack: If for some reason fitness belt isn't working out for you, contact us for a full refund. We are US Company with a quickly responsive Our-job-is-to-make-you-happy Customer Service. No Pockets? No problem!The ultimate hands-free solution to stashing your stuff! 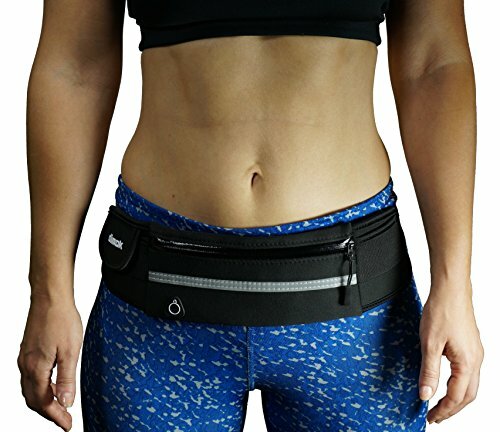 StashBandz with multiple different uses, is the only cute fanny pack, insulin pump belt, jogging or running belt, waist pack, money belt, and travel belt, passport holder uniquely designed to hold large cell phones, a passport, and all your extra on-the-go travel accessories. Go hassle free with freedom from a purse. Safely travel the world holding as much as your purse discreetly undercover. Rock-out at concerts worry-free (hides a flask). Go purse-free at theme parks, sporting events, at the office, and everyday errands. Throw in an ice or heat pack for menstrual cramps and backaches. The all-in-one accessory, providing secret pockets for any hands-free, purse-free occasion.Sizing: The success of your hip belt depends on a good fit. If your belt does not stay in place, you have the wrong size. Sagging = too big, riding up = too small. We offer free exchanges. Please follow our sizing chart. We take all factors into account, such as, pockets being fully loaded with high activity, and worn over clothes.Shipping: Orders ship from California via USPS first class mail or USPS Priority, if expedited if chosen at purchase. Orders ship within 24 hours Monday-Thursday. Orders received Friday-Sunday are shipped on the following Monday, pending holidays Returns or exchanges: Your satisfaction is guaranteed! Returns or exchanges are never a problem. We offer free shipping to exchange an item. You ship the item back to us, and then we pay for shipping the new item. Further questions? Ring us toll-free; we're here to help! SECURE 4 WIDE POCKETS. NEW CONCEALED ZIPPER POCKET ALL COLORS. Pockets load from the top with pickpocket proof fold over locking flap to secure items. 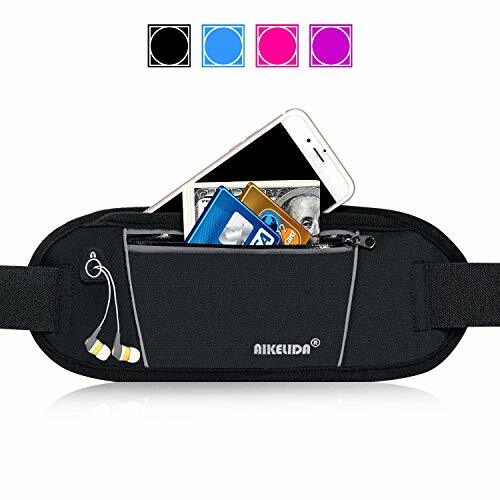 Unisex Workout - Travel Belt Fits iPhones and any size cell phone vertical or horizontal, passport holder, ID, money, keys, flask holder, glasses, travel wallet, insulin pump holder, and more. We focal on outdoor items. The High quality is our culture. The pouch is very comfortable to wear. It's made of high elastic straps that can be adjusted from 26.7 "to 43.3" which gives it an amazing fit so that it is suitable for most men and women. This ultra-light weight, durable running belt is perfectly designed for your phone, key and cash. The Breathable material Nylon & Lycra will keep your body cool, ensuring better exercise experience for you. It will not bounce or chafe during long run or intense workout. Exquisite zipper design allows you to enjoy a run without the sound of metal zipper.Black color is for unisex usage without any problem. At USHAKE DIRECT, our first priority is customer satisfaction. We provide 100% Satisfaction Guaranteed and backed by our LIFETIME WARRANTY. Contact us immediately if anything comes up! MATERIAL(Ultra-Light): Nylon/Lycra fabric for moisture wicking, quick drying, stretchable, and great softness against your skin. The material is lightweight so you almost cannot feel it when you put it on. SMART PHONE FIT: for most of smartphones including Apple iPhone 5S, 5C, 6, 6 plus, 7; Samsung Galaxy Note Series & Samsung Galaxy Series; SONY, LG, or any other smart phone compatible. Holdings: Most of smartphones, passport, keys, credit cards, money, energy gels. Ear bud hole is for pleasant music in running. It is great for all forms of exercise including walking, running, hiking, riding bikes, working out at the gym and more. This great product fits so perfectly that you won't even know it's there. The elastic straps and adjustable belt keep everything comfortably snug and close, preventing the annoyance of bouncing items. The neoprene material prevents sliding, so when you take out your smartphone, you don't accidentally pull out all your credit cards at the same time. Ideal for all kinds of sports and exercise, including obstacle course running. You'll always have your phone ready to take that epic photo when the chance arises. You can also use the belt as a treat bag for dog walks or as a wallet/purse during everyday activities. The "Runner's Favorite" dimok running belt is great at night with a large reflective stripe - you can run but you can't hide. CONVENIENT- Keep your most needed items close while exercising or running errands. With your busy life style, it is so important to be able to quickly reach all must-have stuffs. ADJUSTABLE - Fits waist sizes from 28 to 43 with flexible and adjustable belt, you can wear dimok bag on top of clothes as you layer for the winter runs. WATER RESISTANT - Neoprene material ensures all your items stay dry, through rain, mud, sleet and snow. It is machine washable and made for heavy duty use. MULTIPLE POCKETS - Central 8 pouch w/headphone outlet for phones of all sizes INCLUDING iPhone 6 Plus, Galaxy S6, S7, HTC M9 other smartphones. It's a must have item for hikers! We focus on outdoor products. We are devoted to quality. 1. Made of premium nylon and mesh fabric materials, soft and breathable, durable and portable for daily use. 2. There are 2 compartments separately for phone and keys storing, you'll never worry about your phone being scratched when you are jogging or running. 3. The pocket can hold your keys/cash/credit card, while the phone pocket allows for 5.5 inches phone, just take necessities in WATERFLY waist bag, running without any burden! 4. The back side comes with a breathable mesh pad design, soft and comfortable, always keeps your waist dry and fresh. 5. The front reflective strip is a striking sign in the dark and let you obvious be seen at night to ensure your safety. 6. Adjustable waist belt keeps your bag stable and comfortable with you. 7. WATERFLY water bottle waist bag is an ideal companion for running, hiking, walking, cycling, etc. If you have any issues with our products, please feel free to contact us. 5.Zipper Compartments, ideal for money, keys and passports etc. 6.Stylish, sophisticated and ergonomic design. 7.Stylish Bum bags Ideal For Festivals Holidays Shopping. 8.Suitable for: travel, excursions, hiking, cycling, hill walking. 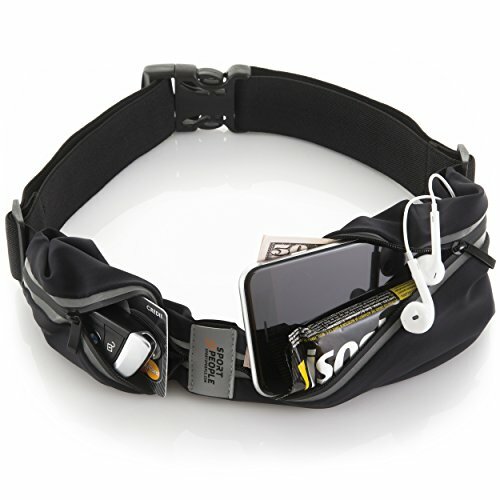 9.A fanny pack/money waist belt for men and women for daily use. 10.Cleaning Method: Hand wash or machine wash at a low temperature. Do not tumble dry. Premium Material Fanny packs is made of nylon with excellent air permeability. 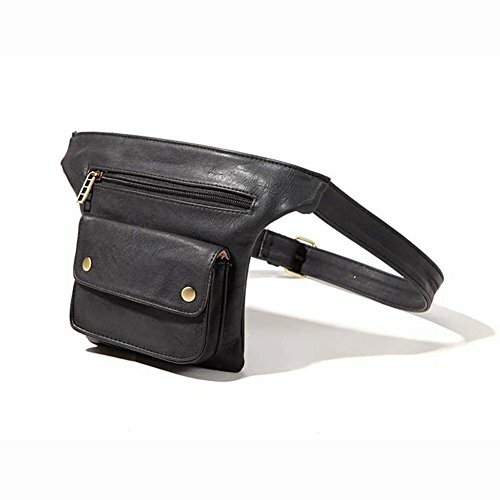 Black color Waist Bag Pack can fit for all ranges of ages: student, unisex adult, the elder. Rust-proof zipper is not too tight and flexible, so it can be easily stretched but still retain its original shape. 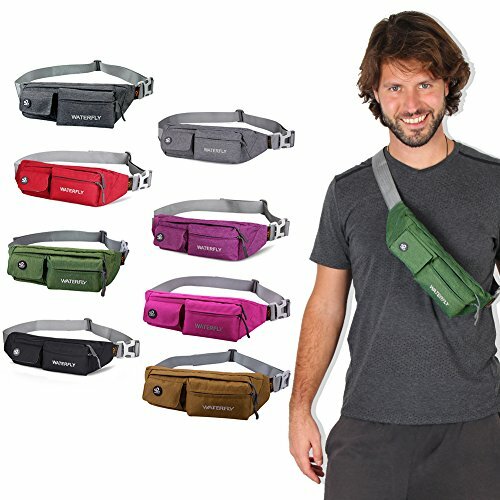 Adjustable Strap The waist bag has adjustable elasticated belt, fits for the waistline from 23.6 - 43.3 (60cm -110cm), making the bum bags belt ideal for most of figure. The buckle & the belt are sturdy, compact and reasonable design will not make your body feel restraint and discomfort, therefore in the process of running, bouncing and so on does not need to worry about the belt body to bring the burden and trouble. Large Capacity The backpack size is about 16.5x 6 x 4.3, dumplings appearance with two separate compartments with zippers, each compartment design can help you reasonably allocate and store personal items, and simple and intuitive zipper opening design can help you find items quickly and directly. It can hold the iPhone 7/8/X Plus, wallet, charging treasure and so on. Comfortable and portable, it will not be distorted and convex because of storage. Headphone Jack Designed to make it convenient to listen to music and use the function of call during exercise and fitness, so that you can free your hands to enjoy your personal sports time. Many ways to wear this waist pack - You can wear it in front of your waist, back on your hip, slant across your chest or over You shoulder. Gift Choice Buy this as a gift for your friends, families, kids, which will be great! THE ORIGINAL SMALL PERSONAL ITEM BELT A longer pocket makes ours NEW and IMPROVED Original SPIbelt perfect for holding larger smart phones like the iPhone 6 as well as keys, cash, credit cards and even a passport. 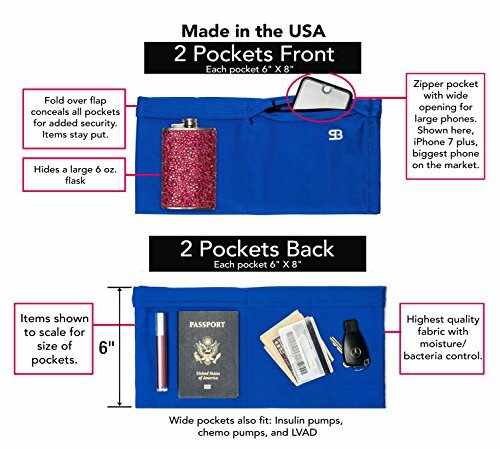 Fits Large Phones - Compatible with phones up to 6.5 inches long including the iPhone 6, iPhone 7, iPhone 8 and iPhone X, Nexus 6, Galaxy S8, Galaxy S9, and Galaxy Note 3. Comfortable - no bounce! - Made of stretchable Spandex. Soft elastic prevents chafing - does not bounce or ride during rigorous activity or running. Sturdy Buckle and Glides - Good construction of the Buckles and glides for even the most active users. Expandable and Adjustable - Pocket expands to 6.5 x 3 x 2 inches. Fits waist size 24 through 47 inches. Just because it's sturdy doesn't mean it has to be bulky. The lightweight feel of this waist pack maximizes your comfort while you wear it. It can be adjusted from 28" to 46", which gives it an amazing fit so that it is suitable for both men and women. It is ideal for running, jogging, hiking, walking your dog, and other outdoor activities where you need to have your hands free. Using skin-friendly soft breathable fabrics and adjustable elastic strap, perfect fit for waist curve, Comfortable and convenient for running or other outdoor activities. Fits waist sizes from 28 to 46 with flexible and adjustable belt, Two different sizes pockets to store workout necessities such as phones, keys, watch, wallet etc. Unique cut out headphone hole for music enjoying during exercise, Designed with reflector for safety and visibility when active in the dark. Lightweight and Durable, Suitable for Running, Fitness, Cycling, Walking, Jogging, Climbing, Gym Workouts, Travel and Outdoor Sports. Why Choose PONRAY Running Belt? The pocket zipper is easy to crack, waistband is easy to break, pocket space is small, not waterproof, no lightweight, no independent compartment to protect the phone screen, waistband is not suitable, no headphone jack design, not suitable for heavy duty case and so on. Now we have solved all the shortages by our new pocket, which will let you enjoy your sports freely! Note: It's can easy hold your phones with heavy duty case. Roomy Zipper Main Compartments: Perfect for storing keys, credit cards, money, passports, headphone, gels, tissues etc. Velcro-Closure Front Pouch: Provide independent protection for your phones from screen scratches. Headphone Jack Design: You can easily listen to your favorite music and enjoy a pleasant and relaxed workout experience. Durable Zipper: Quality zipper design allows you to enjoy a run and you no need to worry the zipper was broken. Suitable For: Running, travel, excursions, hiking, cycling, walking, fitness, gym workout, yoga exercise etc. Enjoy Your Sports: PONRAY running belt is non bounce. Hand free while you go running, walking, hiking, cycling, fitness, gym workout, yoga exercise and so on. Suitable for All Family Member: With its adjustable length from 23" to 55", the belt will fit to your from kids, parents to grandparents. Strong adjustable elastic waistband ensures it bounce free. 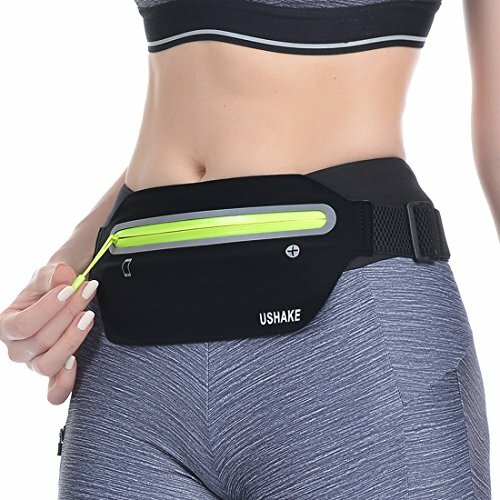 AMAZINGLY COMFORTABLE RUNNING BELT - Running fanny pack made of lightweight and breathable Lycra fabric for moisture wicking. Runners belt material is lightweight so you almost cannot feel it when you put it on. It doesn't bounce. No rubbing. SWEAT-PROOF AND RAIN-PROOF - Made of water resistant and durable tear-resistant material. Water resistant running fanny packs can keep your phone and valuables dry while you are doing exercise, don't worry the sweat will moist your phone. ADJUSTABLE ELASTIC WAIST STRAP - PONRAY Running belt is equipped with a soft elastic waist and fits all shapes and sizes, as it comes in adjustable length from 23'' to 55''. It is suitable for all family members, from kids, parents to grandparents. Strong adjustable elastic waistband ensures it bounce free. 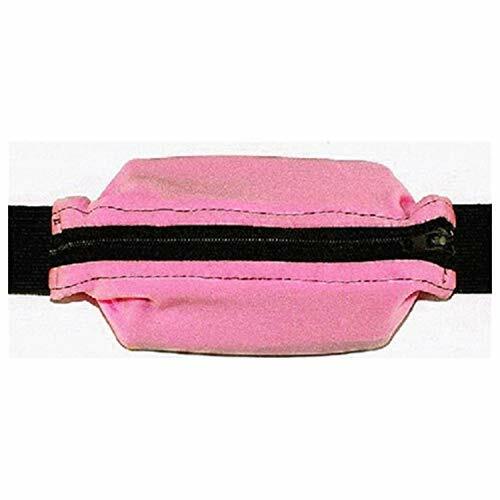 SMALL SIZE AND LARGE SPACE - Roomy running waist bag size is about 8 x 4 , and has two separate compartments. The zipper main compartment perfect for storing keys, credit cards, money, passports, headphone, gels and tissues etc. The small velcro-closure front pockets provide independent protection for your phones. FIT ALL SIZE SMARTPHONE - Spacious pocket can easy fits up all size smart phone such as iPhone X, 8, 7 Plus, 8 Plus, 6S Plus, Android Galaxy S10+, S9+, S8 Plus, S7 Edge, Note 9, Note 8, LG V30 etc. Roomy running belt will easy hold your phone with heavy duty case.